In a rapidly urbanizing global economy it is critical to identify the resilience and adaptive capabilities of arid and semi-arid agroecological systems to urbanization. A joint project between the Swedish University of Agricultural Sciences (SLU) and ICRISAT on “The Dynamics of Urban Sprawl: Land-use changes, Food Supply & Sustainable Agriculture Production Systems in the Arid and Semi-Arid Zones” aims to do just that. The project selected two growing mega cities: Cairo in Egypt for the arid ecology and Hyderabad in India for the semi-arid ecology. The project will investigate and compare agronomic, institutional and regional variations in these two agroecologies. A system-resilience framework will be developed and used to study the interlinkages and impacts of urban sprawl on land use, changes in resource use, agricultural production and food security, which in turn affects the competing use of natural resources such as land and water. Adaptation and resilience of the food supply and sustainable agriculture production systems to urban sprawl will also be examined using the framework. The results will strengthen the understanding of urban system resilience as well as generate knowledge in relation to how land use, agricultural production and food security interact in the crop-livestock systems in the arid and semi-arid regions. This will help direct attention of researchers and policy makers to this issue. 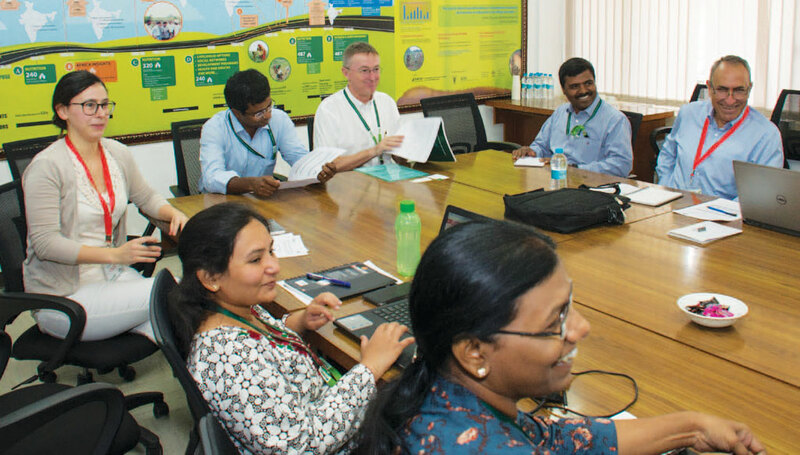 The project kick-off meeting was held recently at ICRISAT-India from 20-22 March. Participants of the project include Prof Carl Johan Lagerkvist, Professor and Head-Department of Economics, SLU; Prof Ayman F Abou Hadid, Arid Lands Agricultural Graduate Studies & Research Institute (ALARI), Ain Shams University, Cairo; Dr Ranjan Kumar Ghosh, Assistant Professor, Indian Institute of Management, Ahmedabad; and Ms Maria Eduarda Rigo Cavinato, Research Assistant, SLU. The project team also visited Dokur village in Mahbubnagar district, Telangana, on 22 March and interacted with the farmers to better understand how they have responded to the growing urbanization. Read about their visit here.